Edith Stevenson Wright (1883 - 1975) was born in Youngstown, the daughter of a British immigrant steelworker. She spent her life largely in Cleveland, Ohio, as an accomplished and (as such things go) successful portrait painter, living and working in the Hanna Building penthouse. She was married to and divorced from theater critic Ivan Wright, they had two children, Blaine and Dare. Dare Wright was a fashioned model, later photographer, and author of The Lonely Doll (1957) as well as a series of other children's books. Edith began training at the age of 13 at the Central Ontario School of Art, and by 16 she was mentoring under J.W.L. Forester, a British painter of government ministers. In 1954 Edith had painted a portrait of Winston Churchill, which was unveiled at Christmastime at the University of Bristol. Sir Philip Morris, vice chancellor of the university, was so taken with the work that he told Edith he was going to arrange a sitting with the 28 year-old Queen Elizabeth, then only one year into her reign. Using dare as a model, she created an eight-foot drawing to prepare for this most amazing opportunity, which unfortunately never materialized. The only Edith Stevenson Wright I have ever seen up and close and in person used to hang in the Schubert Library at the Cleveland Play House. It was a bit of a surprise, last fall, finally - after three years in the Playwrights Unit - to climb the circular staircase to the balcony of that dectagonal room to get a closer look at the cases filled with marionettes, and the portraits of former CPH Artistic Directors. I did not expect to come face to face with an artist whose name I was familiar with. Edith had painted a portrait of actress and company member Helen Watkins. 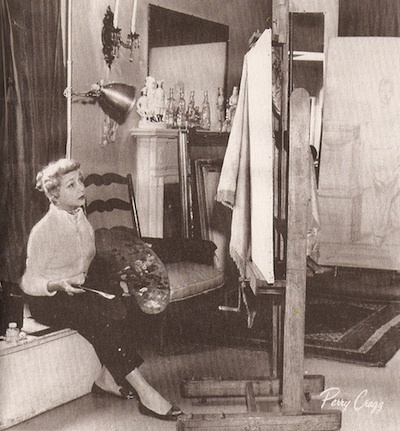 She was a player with CPH for decades, Edith's painting dates from the 1950s. In The Crucible, Ms. Watkins played Rebecca Nurse. My goodness! That is very interesting, may I ask who they are of? Good to hear from you again! I would suggest getting in touch with the estate of Dare Wright at http://www.darewright.com/ Best wishes.